ጥሩ ሃሳብ ነው። የቅዱስ ሲኖዶስ አባላት ስልክ ቁጥር የምናገኘው የት ነው? Let's call all members of the electoral committee, including MK, to alienate themselves from this historical transgression. There is a time for everything, as Orthodox believer what I have heard and seen is too much,enough is enough. We must stop this now, and we have an obligation to protect our religion from those who trying to destroy us. This is our time and our chance to do something. May GOD BLESS US Amen. This is a great idea. I support you 100%. We need to voice our protest. In the mean time, it can help to name the bishops who are pushing the election agenda. Naming and shaming can stop them from doing further damage. Be very careful. At a time when the government is under assault from Islamic extremists,if we add further pressure and things go out of control, we would risk losing our country. አሳ ጎርጓሪ ዘንዶ ያወጣል እንዳይሆን የኛ ነገር እየተስተዋለ!!! 1. If the bishops in Ethiopia proceed with the election of a patriarch, prior to the conclusion of the peace process, it would constitute a major, catastrophic mistake which is tantamount to crossing the red line in the eyes and minds of the Ethiopian EOTC adherents. Therefore, all of us should do our religious duty of fighting for the unity of our church by undertaking a public demonstration after the church services every Sunday. 2. Tragically, it's apparent that the Ethiopian Government which is behind this huge blunder is making another ill-considered mistake similar to the one perpetrated by Tamrat Layne who kicked out Abune Merqorewos without having read the church's laws (the Feteh Menfesawi) that stiuplate that a patriarch cannot resign! Now, again, the Government is facilitating a division within the church without realizing that such a step will only result in a greater public discontent and opposition to the regime. 3. According to item 338 of the Feteh Menfesawi, those who have applied a Wugzet should not associate, pray, or converse with each other. However, it is known that the peace delegations met without removing the wugzet first. In addition, the peace delegation from Ethiopia is currently under a deep embarrassment as an election of a patriarch is apparently in progress even before the peace process is accomplished! 4. It is time that we start to fight for our beloved church!!!!! Let me say something. This government knows the Ethiopian people, especially the diaspora, very well. Now even they have a slogan, which reads as "The Camel never stop moving while the dogs bark". I think it has some truth; we start something and we bark here and there and after sometime we drop the case just like a free fall. Almost a year ago, our opposition had been intensified regarding the situation of our beloved monastery (Waldeba), now that opposition has been dropped somewhere but our fathers in Waldeba still suffer, some of them in jail. Some of them even got in trouble because they leaked the news to us. For some reason, we start something but never finished it. So, the woyanne government knows this very well. So, unless we change our attitude and tries to make a kind of little obstacle to pause their Camel from moving fast by smashing our heritage and peaceful relegion, trust me, if the woyanne government wants it, it will happen and they will put not only a person who will do everything for the government not for our church and breath with Woyanne lung but also a semi-protestant leader. The latter is the most dangerous move, and according to the book written by Aregawi Berhe, this is infact one of the Woyanne dogma, i.e., dragging the EOTC to slow death. So, my comment to the diaspora fellow Ethiopian, do not be fast to start something, if we do we need and we MUST steak with it until we get some convincing results, otherwise the Woyanne government will continue treating us as barking dogs. NB: since it is a different openion, I wouldn't be surprised if you do not post it. MK Center must must react now!!! Haymanot yesebeknew hizb sinfera kaye be haymanotu yifetenal.Please MK Center react now. Our church has been taken over by Tehadso and Semi protestants. That is for sure. ምነው መንፈሳዊነት ርቆ ልጅነትና ፖለቲካ ሆነሳ! ግድ የለም ባለችን ዕውቀት አሁን ባለንበት ፈታኝ ወቅት በዕምነታችን እንፅና። አልያ ስሜት መጥፎ ብቻ ሳይሆን ያሳውራል! እጅግ ልብ የሚነካ ኀዘን ነው -በእውነት አራት ኪሎ ያላችሁ አባቶች በስንቱ ነው የምትበድሉን? ልብ በሉ ዋልድባ ገዳም ሲታረስ ዝም! ገዳማት ሲቃጠሉ ዝም! ካህናት ምዕመናን ሲታረዱ ዝም! ቤተ ክርስቲያን ሲቃጠል ዝም! የቤተ ክርስቲያን ንብረት በባለጊዜ ሲዘረፍ ዝም! ኸረ ስንቱ... ምን ላይ ነው የእናተ አባትነት? ምን እያደረጋችሁ ነው ያላችሁት? የልጆቻችሁን ቃል ለምን አትሰሙም ? ፓትርያሪክ ለመምረጥ ምን አስቸኮለ? አሁን እርቅ ይደረግ ሲባል እናተ ለመሾም ደፋ ቀና ትላላችሁ እርቅ ነው የሚቀድመው ወይስ ሹመት? በጣም በጣም የምታሳፍሩ ናችሁበእናተ ለስልጣን እንዲህ መራኮትምክንያት እኛ ልጆቻችሁ በመናፍቃን ፊት እራሳችንን አስደፋችሁን ለመሆኑ ይህን ሥራችሁ ይታያችሁ ይሆን? ቤተ ክርስቲያኒቷ ወዴት እሄደች እንደሆነ አላወቃችሁም እንዴ? ዘመኑ ምናምንቴ ነው የተመረጣችሁበትን ኃላፊነት በብቃት ተወጡ! እርቅን አስቀድሙ! ይህ ባይሆን ግን በታሪክና በእግዚአብሔር ዘንድ ተወቃሾች ናችሁ እንዲሁም ወደ ፊት በእናተም በቤተ ክርስተያናችም በሀገራችንም ላይ ከፍተኛ መብረጃ የሌለው ችግር ይፈጠራል አስተውሉ እኛ በሕዝቡ ውስጥ ነው ያለነው ወደፊት ሊከሰት የሚችለውን ነገር ሁሉ እየሰማን ነው ያለነው መንበሩ አንድ ነው እሱም እግዚአብሔር መንፈስ ቅዱስ የመረጠው ሰው ነው የሚቀመጥበት እንጂ ገንዘብ፣ ብኄር፣ጉልበት፣ቡድን...የመረጠው አይደለም የምዕመናኑን ድምጽ ካልጠበቃችሁ ማንን ልትመሩና ስለፍቅር አውደ ምሕረት ላይ ቆማችሁ ልታስተምሩና ልትባርኩ ነው? እናተ ምሳሌ ካልሆናችሁ እንዴት እንከተላችሁ? አስተውሉ!!! ወይስ እንደፈርጣማው ክንድና ጉልበተኛው መንግሥታችን ኢሀዴግ በመሳርያ ልታንበረክኩን ነው? ያ አይሆንም! ወይስ መንግሥት "እኔ የምፈልገውን ፍላጎቴን የሚያረካልኝ ሳዘው የሚታዘዝ አድርግ የምለውን የሚያደርግ ዝም ... የሚል ሰው መርጬ አስቀምጣለሁ እናተ ብቻ አርፋችሁ ተቀመጡ ካስፈለገም ጥቅማጥቅም ይሰጣችኋል እንቢ የምትሉ ከሆነ ደግሞ እንደ እስላሞቹ አሸባሪ እያልኩ ወደ ወኅኒ አወርዳችኋለሁ አላችሁ ወይም የጳጳስ ምርጫም በቀበሌ እንዲሆን አደርጋለሁ… ተባላች? የተዋሕዶ ሐይማኖታችን ለሀገር ለወገን ታሪክ ባሕልን ቋንቋን... ኢትዮጵያ የሚለው መልካም ስም ጠብቃ አስጠብቃ ያለች ወልድ ዋሕድ በተዋህዶ ከበረ ብላ ያስተማረች የምታስተምር ታሪካዊት ሐይማኖታችንን እንዲህ በቀላል ተለሳልሰን አሳልፈን ለአውሬና ለሆዳም እንደማንሰጥ በአጽኦ ልታውቁ ይገባል ይበቃል እስከዛሬ በውስጥም በውጪም በመናፍቃን የተቦረቦረች ቤተ ክርስቲያናችን። ሁላችሁንም አባቶቻንን በአባትነታቸሁ እናከብራችኋለን ፈለጋችሁን እንከተላለን ግን ተዋሕዶ ሐይማኖታችንን በጊዛዊ ጥቅም አታስጠቁብን ሲሆን “ እምነ መንግሥት የዓቢ ክህነት” ነበር ከመንግሥት ክህነት ይበልጣል ነበር እናተ ግን የክርስቶስን ሥልጣን ከመንግሥት እጅ በታች አድርጋችሁ ቤተ ክርስቲያናችንን አዋረዳችሁ ገንዘብ ቢሰበሰብ ዋጋ የለውም ቀሪ ኃለፊ ነው የማይቀረው ሳይታሰብ የሚወስደው ሞተ ሥጋና ሞተ ነፍስን ማሰብ ያስፈልጋል ብዙ አይተናል አለን አለን ሲሉ ባዶ እጃቸውን ያለፉ፡፤ ክቡራና አበው ሊቃነ ጳጳት የመንፈስ ቅዱስን ዝናር ታጠቁን እኛ ልጆቻችሁ በጣም እየተጎዳን ነው ያለነው እናተ ብርብርብ ልብስ ስለበሳችሁና ጆራችህን ስለሸፈናችሁ ላይሰማችሁ ይችላል አሁን ግን በግድም በውድም መስማት አለባችሁ በተደረገው ነገር ሁሉ ውስጣችን በጣም ነው የቆሰለው ከፍተኛ ጥንቃቄ አድርጉ ነገሩ አሁን በጣም የመረረ ነው ልታቆሙት በማትችሉበት ደረጃ ላይ ደርሷል እራሳችሁም አስቡ "ኢታኅትት ርዕሰከ ለብእሲ አብድ"
Good job deje selam can you take a lead and manage us fot this movment. people camon lets we talke about this ledership role.Let's do something about this "action speek louder than wordes"
What is wrong with us people? Are we not sons and daughters of our fore fathers like Abuna Petros! Are we caring less than the Muslims do for their freedom of faith even when we say we are on the right way and following the true living God which we do!?! Look what they have been doing, can we imagine what they would have done had Waldiba, Ziqwala etc were theirs!? Let us stand up for our life! Let’s say enough is enough. Let us fight for the truth, let us be courage for those very very little true and courageous fathers left in the Holy Synod. Let them know we are with them by making sure that we will not let ANYONE decide for us what we should for our beloved mother church. Time to die for the unity of our church! We saw our church divided in our time; we should also see it united in our time! We know the problem and we must be the solution too. If not us who else then!? the next generation? NO! Don’t let any politician or racist spoil this momentum and the opportunity God has given us. May God give us the good will, the courage and strength to stand together for our mother church! Amen. እናታችንን ከሕግ ባሏ ከአባታችን በጉልበት ነጥቆ እርሷንም ሚስቴ እኛንም ልጆች ናችሁና እንደ አባታችሁ አክብራችሁ ተቀበሉኝ የሚለውን አመንዝራ ግለሰብ ''አባታችን'' ብለን እንድንቀበለው የሞራልም ሆነ የሃይማኖት ግዴታ የለብንም። ''እምየ ቅድስት '' ብለን በምንጠራት የኢትዮጵያ ኦርቶዶክስ ተዋሕዶ ቤተ ክርስቲያን ላለፉት 20 ዓመታት እየሆነ ያለው ይህን ምሳሌ ያለምንም ጥርጥ የሚያንፀባርቅ ነው። እናት ቤተ ክርስቲያናችንን ከሕጋዊ ፓትርያርኳ በጉልበት ፈንግለው በአመንዝራነት መጫዎቻ ሲያደርጓት ብዙወች ''እናቴን ያገባ ሁሉ አባቴ'' ብለው ተቀብለው ቆይተዋል። አሁንም በድጋሚ ይችን እናታችን ለሌላ አመንዝራ ለማስፈንገል ሸር ጉድ እያሉ ነው። ታድያ ይህን ድርጊት የሚፈጽሙትን በስማቸውና ለጌጥ በለበሱት ቀሚስና ቆብ እንዲሁም በጨበጡት መስቀል ብቻ ''ጳጳሳት'' ብለን እንድንቀበላቸው የትኛው መጽሐፍ ቅዱስ ወይም ቀኖና ቤተ ክርስቲያን ነው የሚያስገድደን ? ሕግ ጥሶ ሕጋዊ በሉኝ የሚል ሲኖዶስስ እንዴት ብለን ነው ቅዱስ የሚለውን እግዜብሔር እራሱ የሚጠራበትን ስም ሰጥተን ''ቅዱስ ሲኖዶስ '' ብለን የምንጠራው ? አንዳንዶች ''ሲኖዶስ አይሰደድም'' እያሉ ምዕመናንን ሲያደናግሩበት ስንታዘብ ቆይተናል። ሲኖዶስ ቀኖና ቤተ ክርስቲያንን ዓለማዊ መንግሥት ስላዘዘው ብቻ መጣስ አለበት የሚል ሕግ የት ነው ያለው ? ''የሲኖዶስ አባላት ነን '' እያሉ ለሥርአተ ቤተ ክርስቲያን በመቆም ፋንታ ለዓለማዊ መንግሥት ሥርአት ቁመው የምዕመናንን አንድነት የሚበትኑ በምን መንፈሳዊ መስፈርት ነው ጥሩን በሚሉን ስም ለመጥራት የምንገደደው ? ልንጠራቸው የሚገባው በግብራቸው ካድሬ ብለን እንጂ የሲኖዶስ አባላት የሆኑ ጳጳሳት ልንላቸው አይገባም። ለጥፋት ሥራቸው ልንተባበራቸው አይገባም። የክርስቶስ ተወካዮችና የመንጋው ጠባቂ በመንሆን ፋንታ የወያኔ/ኢሕአደግ ተወካዮችና የመንጋው በታኞች የሆኑትን ፥ በክርስቶስ ስም የሚነግዱትን አስመሳይ ጳጳሳት አመራራቸውን መቀበል ለእኛ ለምዕመናን በራሱ የማይሰረይ ኃጢአት ነው። ለማን እየሰሩ እንደሆነ በተደጋጋሚ እያሳዩን ነው። እኛ ኦርቶዶክሳውያን እነሱ በሚሰሩት ኢከርስቲያናዊ ተግባር እየተበሳጨን በስውር ለሚሠሩለት ለምዕራቡ የፕሮቴስታንት church እጃችን እንድንሠጥ ለማድረግ እኛን መስለው እነሱን ሁነው ተልእኳቸውን እየፈፀሙ ነ ያሉት። ..ስለዚህ ልንነቃባቸው ይገባል ። የቀበሮ ባሕታውያኑን ከላይ በለበሱት uniform ብቻ ለእኛ እየሠሩ ነው ብለን ''ብፁአን አባቶቻችን '' እያልን መታለል የለብንም ! በቃችሁ አወቅነባችሁ ! የምንላቸው ጊዜው አሁን ነው ! ጀሮ ያለው መስማትን ይስማ ! To one anonymous who gave comment being concerned about government. Let me tell you frankly, this government is the worst enemy of our church . I am not saying this with mere hatred .It destructed the church materially and morally.We tolerated much , much,....... What this government did against our church is countless. May be ,we will revenge. They blasphemed our church, gave cover for those who burn church ,massacre followers ,took many possessions ,..... I have never been concerned about political issues. But to protect my church I will be beyond politician . Actually , now onwards , what every follower of Ethiopian Orthodox Church should do is this. Now the government is trying to directly lead the church . How can we tolerate this ? After all what is our possession beyond church. Every thing is meaningless. We need compensation for what has been done so far against our church. Christians shot and buried like dog without investigation in Asebot. Church burned by the order of government body in Silte.Junedin Sado participated in assassination of Jimma Christians.Memhir Zemedikun jailed for he revealed the hidden agenda of Tehadiso. 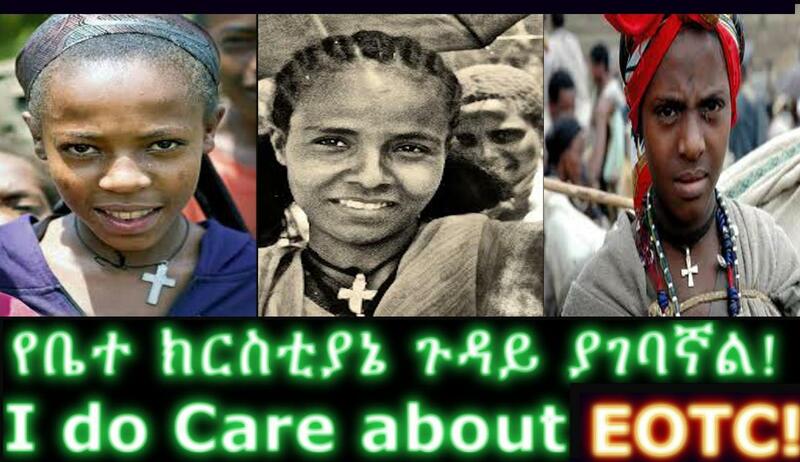 May be you may not forget what Aboy Sibhat told how much he hates Ethiopian Orthodox. Anyway it is impossible to list here . It is countless. This government is enemy of our church. Tewegn bakih. Gizena bota alewu. Gin Tarik Endifared adera eyeseten egirachinin beltew cheresu. Ahun egnam sanalf tarik liyadergun deresu. Bemaiggeba yilugnita yihun firhat alekin.Ebakachihu orthodoxes matifo yefrhat ayilut yeyilugnita menfes lelijochachin anawers! !Betem zegeyen enji alchekolinim. Minim tifatim yelebinim. Ennie emilew, synod yegna woyis ye mengist? Bete kristian seqatel, mi'emenan sitaredu, sibareru, siwakebu zim yale ahun menew le patriarck miricha yetetadefew? Ende qigne gazzie enante tseliyu egna poleticawin enseralachihualen new? Ye egziabeher bet yewebedie hona atqerim!! It needs courage for this, but our bro and sisters are engaged in worldly life, and they left religion for the olds and ladies only. So we need to engage in everything to defend these EPRDF cadres. Think before you leap. The action needs a careful examination that whichever sides exploit this weak strategies and plan of demonstration to weaken the EOTC more than that we have been now. The pro or anti government political groups are always working to divide and weaken the church. We know that majority of our politically active people working inside or outside are communism infected individuals and the division of our church was also made by both groups for their political goal and agenda. I do not think that you will be able to make this movement free from infiltrator of both sides and once the fire sparked then it will go out of your control and became a good platform for their politician game that they love seeing blood of people for their media propaganda and so called struggle. Therefore, I wish from both sides genuine Christians and close friends of the bishops try to influence the committees to reach to agreement and work for the church than for their individual ego. The mysterious part of this problem which always puzzles me, why our Exile Patriarch does not able speak out for the ETOC Christian publicly about the past, present and future of our church instead of mocked by politician or politically coated bishop. ምንአለ! አንድ ነገር ቢተነፍሱና ቢገላግሉን? ምእመናን እንዲህ እየተቸገሩ የእርሳቸው ዝምታ ከምን ይቆጠራል? I read all the comments mentioned above. They all disapproved of the new Patriarch election. It may be time for those church " fathers" who try to dismantle our holy church to stand and think. These fathers should use their mind. otherwise you can't stop the heart-broken mass. you will be removed from OUR church. This is not your private property. This church belongs to 50,000,000+ folowers. You PAPASAT should learn from "aba" Paulos's mistakes. He amassed and stolen millions of dollars of church money and property. Where is he now? What is the place of "aba" Paulos going to be in the history of this great country in general and of in our holy church in particular? As we know him, he was the bad guy. God gave him 20+ years to return to his mind. Instead of using the time to good deeds, he destroyed OUR HOLY church more than ever.Thanks to GOD he is dead now. We all know these. It is just a recent memory. I put it here as a reminder.My point here is: You guys should learn from the mistakes of the past. Period!!! STOP ABUSING OUR HOLY CHURCH! Otherwise the worst will come. We the laity simply are not going to sit and see when our church, our hope, our way to eternal life is being destroyed. I hope you get my point and you read and act accordingly. This is the voice of the mass. you should listen to our voices! This is the 21st century. I hope you know what I mean.